/ Analytics Blog / NextGen Data / How Will Oregon Rent Control Impact Portland’s Apartment Market? Oregon just imposed the nation’s first statewide rent controls, and while rent control never benefits the housing market, the state’s new regulations don’t appear especially restrictive. State lawmakers passed Senate Bill 608 in February to limit price increases on existing renter households to 7% annually on top of local inflation rates. These restrictions, which took immediate effect, apply only to renewal leases in market-rate rental units older than 15 years. Newer buildings are exempt, as are new leases at all properties. Designated affordable housing properties are governed by separate rules. Given limitations of this statewide measure, it doesn’t seem the new rent controls create an immediate problem for Portland-area operators. Renewal rent growth there has been moderate recently, running below the national average. At the end of 2018, price growth for renewal leases reached 4.7%, well short of the 10.1% that would have been the cap if the rent controls had taken effect last year. Inflation ran 3.1% at the end of 2018. 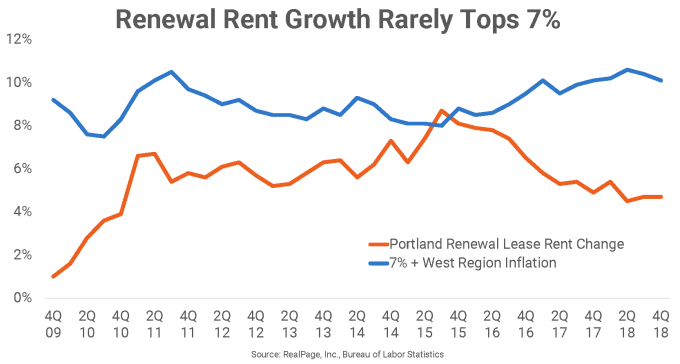 Renewal lease rent growth in Portland has averaged 5.4% over the past 10 years. It peaked in 3rd quarter 2015, with an 8.7% increase. With inflation at only 1% in 2015’s 3rd quarter, that peak increase is the only instance in the past decade that operators would have run afoul of the rent controls enacted last month. But even then, the difference between that renewal increase and what would have been allowed is mild at 70 basis points. Additionally, the renewal rent growth peak came as rents for new leases were rising at an annual rate of 13.2%, the nation’s largest new-lease rent increase at the time. New-lease rent growth in Portland has also eased in recent quarters. Inflation in the West region averaged about 2% over the past decade, according to the Bureau of Labor Statistics. 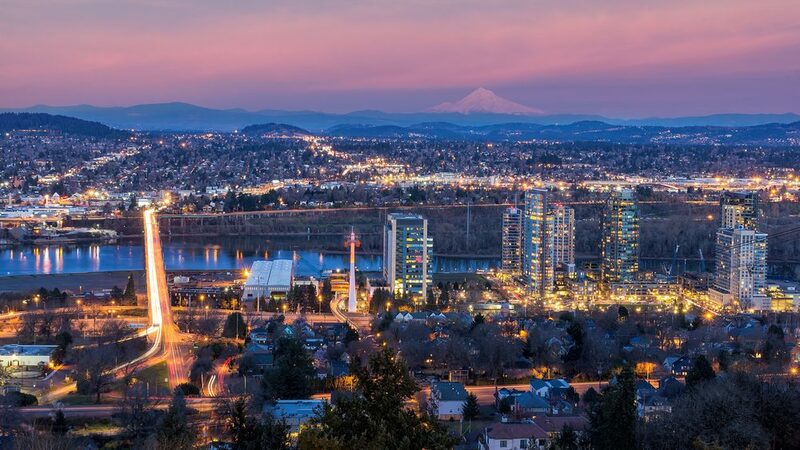 With nearly 210,000 units, Portland is Oregon’s largest apartment market by a large margin. The two next largest, Eugene and Salem, each have about 25,000 units. While Oregon’s new legislation appears unlikely to have much effect on typical operator behavior in Portland, that could change in the future should lawmakers decide to reduce the size of allowable increases. Rent controls are aimed at creating more affordable housing in jurisdictions that implement them. However, they usually have the opposite effect, as rent controls discourage builders from adding new housing which can relieve price pressures in supply-constrained markets. 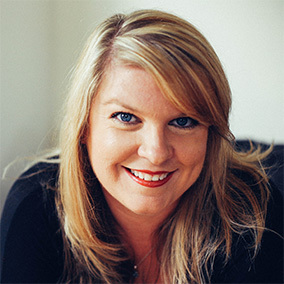 In addition, rent caps provide a disincentive for owners to maintain and upgrade older properties, diminishing the quality of housing over time. Though rent controls have grabbed the most attention, there are other facets of Senate Bill 608 that add regulations to the rental housing industry in Oregon. However, most shouldn’t be very impactful to the Portland apartment market. First, rents for individual households can be raised only once yearly, which is already a typical practice by most operators. Second, regulations prohibit “no cause evictions,” which professional management companies adhere to already. Operators may still pursue evictions in cases of non-payment or other lease violations. For more on Oregon’s new rent controls and apartment market performance in Portland, watch the recent RealPage Asset Optimization webcast.